The approach for the discussion of the Competency Based Methodology is based on the Open Systems Theory. Therefor it is quite important that some time be spent on the basics of Open Systems Theory. An organisation cannot be seen as an entity existing on its own, hidden from any external influences. The existence of an organisation is determined by various influences from the environment within which it exists. It's existence depends on various sources (INPUTS) from the external environment i.e. labour, country laws, regional laws, company laws, availability of resources required for the production of it's products and services, etc. 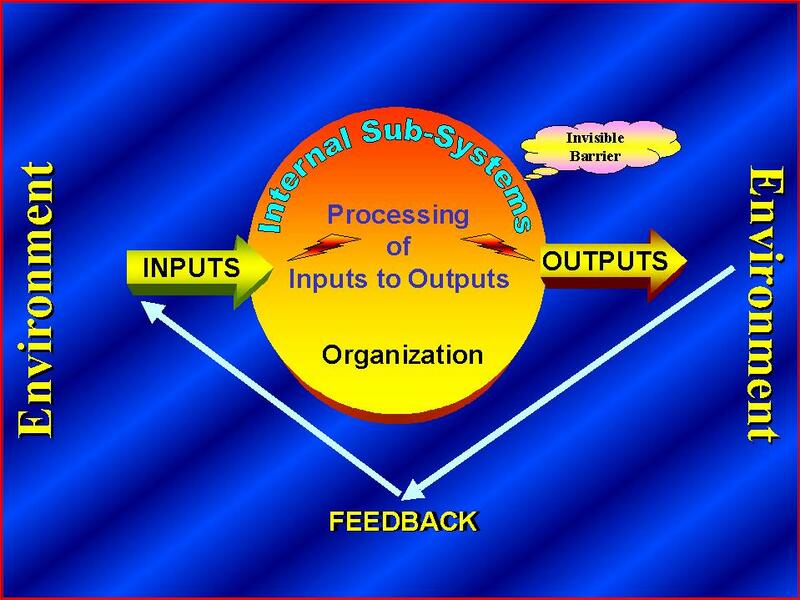 Internally these INPUTS from the environment is processed via various internal processes (or internal Sub-systems i.e. Human Resources processes, Financial processes, Production processes, etc.) to produce the various products and services of the organisation (OUTPUTS). Any changes in the INPUTS (i.e. availability of labour, availability of Capital, changes in interest on Capital, etc.) will have a direct influence on the organisation as an open system. Changes to internal sub-systems may have to be made to accommodate the changes in inputs. For example, sudden skill shortages may require changes in the Human Resources Recruitment interventions. Drastic increases in Capital interest may require changes in the way funds are obtained. The organisation as an Open System is also dependent on the environment for the purchase and use of its products and services. Any changes in the needs and requirements of the environment, has a direct impact on the organisation to sell its products and services to the environment within which it exists. For example the fact that information can be faxed via telephone lines had a major impact on the utilisation of telex machines within organisations. The need for fax machines increased and the need and utilisation of telex machines dropped. If the organisation's core business is the production of telex machines, this change in technology and needs of the environment have a drastic impact on this organisation and it's ability to sell its products and services. It is quite obvious that it needed to adapt some or all of its internal sub-systems to adhere to the needs and requirements of the environment and maybe have to get involved in the production and supply of fax machines. The organisation as a dependent entity is separated from the environment within which it exists by an "invisible" barrier. This "invisible" barrier consists of extremely complex processes and procedures within the organisation to ensure this continuous interaction with the environment. Inputs to the organisation is "scanned" before being allowed to become part of the processing cycle of the organisation and similarly outputs are "scanned" before being delivered to the environment. The "scanning" of Inputs may include for example the interviewing and testing of applicants for employment or the evaluation of various suppliers of products to choose the supplier of the product with the highest quality that is required by the organisation for producing its own products and services, etc. The scanning of Outputs may include the financial auditing or checking of potential customers for credit sales or quality checking of products before delivery to clients, etc. What is important is that the organisation as an entity cannot exist isolated from its environment. As an open system it is dependent on the environment for its inputs, which is processed via internal sub-systems to outputs that will be utilised again by the environment. A continuous cycle of interaction exists between the organisation and its environment. The open systems theory as described above is the basis on which the Implementation of the Competency Based Methodology within an organisation will be discussed in the following pages.